Many adults will gain weight eating 3,000 calories per day, which is beneficial, if you're underweight or trying to increase lean muscle mass. However, active adult men ages 19 to 35 require 3,000 calories daily just to maintain current healthy body weights, according to the Dietary Guidelines for Americans 2010. 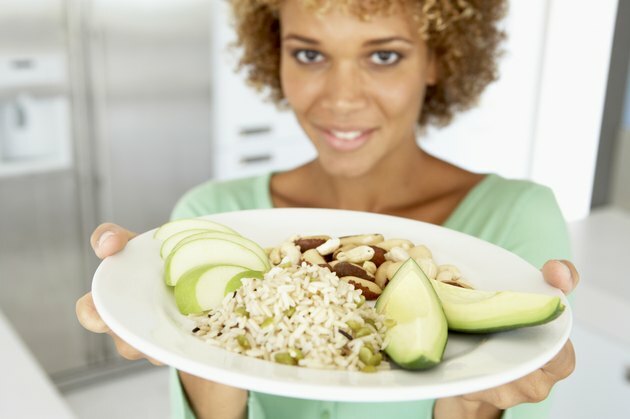 If a 3,000-calorie diet is appropriate for you, then following a meal plan will help you meet your daily caloric needs. To achieve a 3,000-calorie daily allotment, eat often -- every few hours -- and choose nutritious, calorie-dense foods. Examples include nuts, seeds, nut butters, legumes, avocados, plant-based oils and dried fruits. The Dietary Guidelines for Americans 2010 sample 3,000-calorie meal plan contains 4 cups of veggies, 2.5 cups of fruits, 7 ounces from the protein foods group such as eggs, lean meat, poultry, seafood and soy products,10 ounces of grains, 3 cups of dairy foods, 10 teaspoons of oils and 459 extra calories from foods of your choice. To eat 3,000 calories and meet your daily nutrient needs, choose a variety of healthy, protein-rich foods, including dairy products. A 1-ounce portion from the protein group equals one egg, 1.5 egg whites, 1 ounce of meat, fish or poultry, one-half ounce of nuts or seeds, 1 tablespoon of nut butter, one-fourth cup of legumes, one-half of a veggie burger or one-fourth cup of tofu. A portion from the dairy group equals 1 cup of milk, yogurt or soy milk, 2 cups of cottage cheese or 1.5 ounce of hard cheese. To balance out your 3,000-calorie meal plan and add additional vitamins, minerals and fiber, choose nutrient-rich fruits, veggies, grains and oils. A 1-ounce portion from the grains group equals one slice of bread, 1 cup of ready-to-eat cereal or 1/2 cup of cooked rice, pasta or oatmeal. A cup of fruits equals 1 cup of fruit juice, 1 cup of fresh fruit or 1/2 cup of dried fruit. A 1-cup equivalent of veggies equals a cup of raw or cooked vegetables, 2 cups of leafy greens or 1 cup of vegetable juice. A 1-teaspoon portion from the oils group equals 1 teaspoon of plant-based oil, 1 tablespoon of Italian salad dressing, 1.5 teaspoons of nut butter or 1/3 ounce of nuts or seeds. For breakfast, try two slices of whole-grain toast with 1 tablespoon of peanut butter, 1 cup of yogurt, two eggs, 1/2 cup of oatmeal and 1 cup of fresh strawberries. For a morning snack, try 1 ounce of almonds and 1 cup of fresh blueberries. A healthy lunch might include 3 ounces of grilled chicken breast, 2 cups of leafy greens, 1/2 cup of sliced cucumbers, 1/2 cup of cherry tomatoes, 2 tablespoons of Italian salad dressing and 1 cup of brown rice. For an afternoon snack, try 1 cup of low-sodium vegetable juice, 3 ounces of reduced fat cheese, 1/4 cup of raisins and 10 whole-grain crackers. A healthy dinner might include a 3-ounce portion of grilled salmon, 1 cup of steamed broccoli and 1 cup of whole grain pasta with 1 tablespoon of olive oil-based pesto sauce. For an evening snack, try 3 cups of popcorn, 1 cup of kefir and 1 ounce of peanuts.